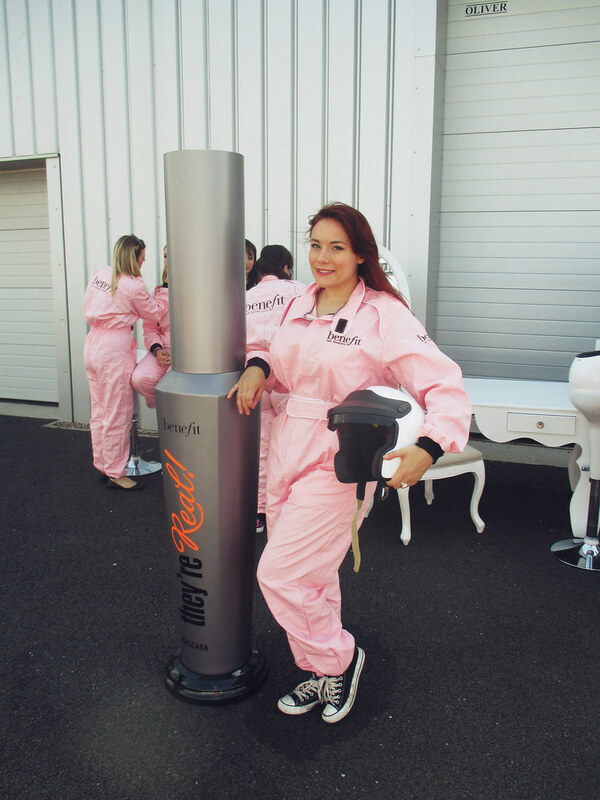 Last week I was excited to be invited down to Silverstone Race Course (home to Formula 1) to film a promo video with Benefit and Citroen. Benefit and Citroen have teamed up to create three beautiful cars, perfect for the city gal, inspired by best selling Benefit products. There is the stunning red car, inspired by Benetint, the badass black and orange 'They're Real Mascara' car and finally the black and silver criss cross design based on the They're Real Push Up Liner. Myself and Becca stayed in a hotel Thursday night, before being picked up by Arabella, early Friday morning to head to the track. Once we were at the track, we were given the brief- we would race around the track (being driven by three professional race car drivers) in each of the cars, making a pit stop upon the completion of the lap, where we had to leap out of the car, perform a makeup challenge using the product inspired by the car we were racing in, before dashing the the next car. 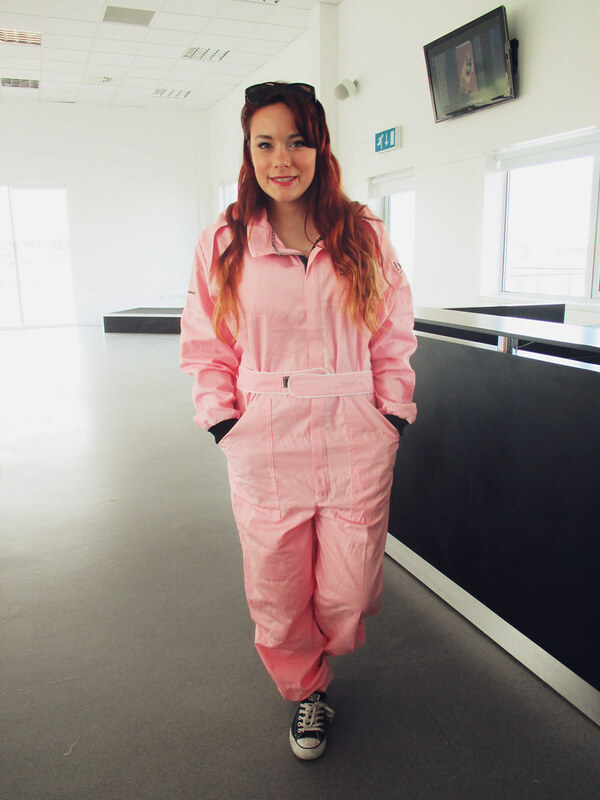 Benefit provided makeup, pink boiler suits and even 'The Stig.' I had such an adrenaline rush, going around the track at break neck speed- I've honestly never had so much fun in a car! After we'd all completed our laps, we were judged on our speed and application of makeup by Benefit's Head Trend Artist, Lisa Potter-Dixon. 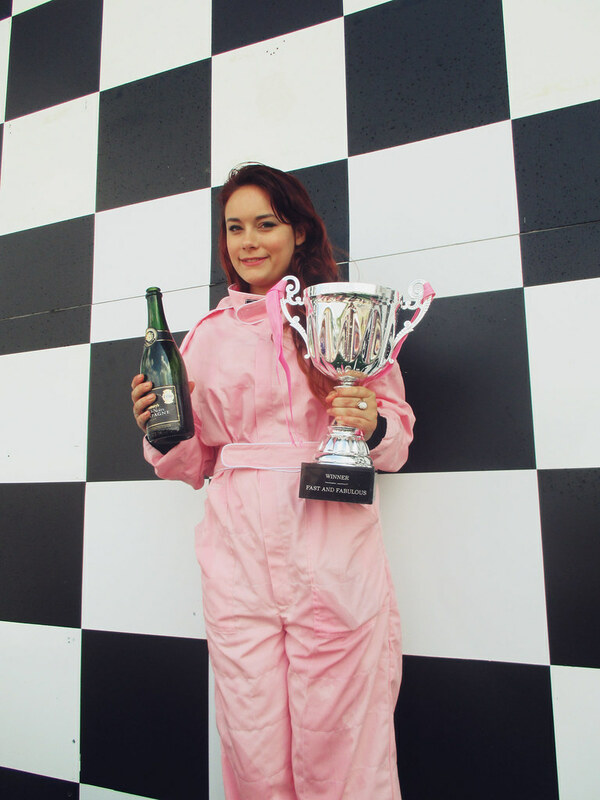 I was lucky enough to win, which meant hoping up on the winners podium, being sprayed with makeup and even getting a huge trophy. I'd like to say a huge thank you to Benefit for the whole day, it was so much fun and an experience I will always remember. I also have a whacking great trophy to remember it by, so I doubt I'll be forgetting it in a hurry! (Okay, I'll stop going on about the trophy now...) I will be sure to share the promotional video we shot, once it goes live and I have linked my vlog of the day below. Don't forget to comment, like and subscribe. Visit my depop here, and don't forget to follow me on bloglovin' here.